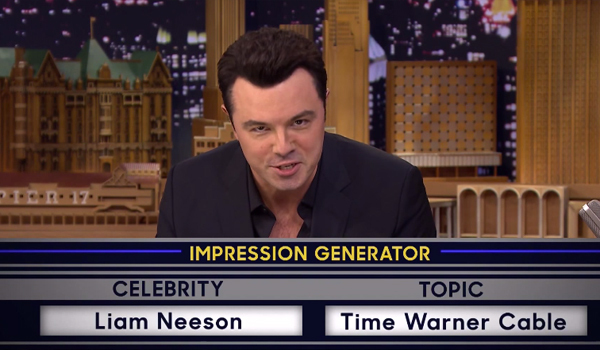 Seth MacFarlane’s busy making the rounds in support of Ted 2, and last night he popped up on The Tonight Show Starring Jimmy Fallon, where he got involved in the latest round of “Wheel of Impressions.” Anyone who knows Seth MacFarlane knows the comedian is pretty good with that sort of activity, but his Liam Neeson impression, in particular, is totally spot-on. Check it out, below. If you haven’t caught one of Fallon’s “Wheel of Impressions” segments before, there’s a button either the host or the guest will hit that generates both a celebrity impression and a topic that must be discussed. During the first round, MacFarlane gets Liam Neeson along with the topic of Time Warner Cable, and the comedian capably fuses the act of setting up someone’s cable package with Neeson’s famous speech from the movie Taken. The impression, complete with a scrunched, serious face, is really good. We mean really, really fantastic. It’s so good, in fact, that poor Jimmy Fallon’s attempt at Jerry Seinfeld complaining about Uber in the following moments doesn’t even rate. Later though, the two men both attempt a Pee-wee Herman who is looking at himself in a mirror. Then, MacFarlane is given the opportunity to riff on Bobcat Goldthwait before closing with another amusing impression of comedian Ray Romano. Jimmy Fallon is usually pretty darned good when it comes to impressions, but next to Seth MacFarlane, he doesn’t really stand a chance. Honestly, I’m nearly always impressed by Fallon’s “Wheel of Impressions” segment. While some of the other games the late night host plays with celebrities are entertaining, this one actually requires a modicum of weird talent from the guests on the show, along with a willingness to really go for an impression. A lot of times Fallon will even do it with a musical component for the musically-inclined guests who’ve popped up, and we’ve seen the likes of Adam Levine do an incredible Michael Jackson impression and even seen Christina Aguilera take on her rival Britney Spears. The segment is likely not the last we’ll see of “Wheel of Impressions,” although I’m not sure anyone in the future will be able to totally top MacFarlane’s prowess at the activity. You’ll have to tune in to find out. New episodes of The Tonight Show air on weeknights at 11:35 p.m. ET, only on NBC.